ZadiGroup is a national and European leader in the components industry for vehicles whom have over 450 employees. Thanks to an active synergy amongst the groups business’ (located in Italy, Germany and India) and R&D team which includes 40 experienced designers, Zadi is committed to offering their customers a complete product offer, working with clients from the very beginning of a new project and then continue throughout the product’s lifecycle. Zadi Spa has been active in the marketplace for 45 years, is the largest company in the Group and operates principally in the field of engineering and product of mechanical, electromechanical and electronic safety systems for vehicles. Zadi supplies the most important companies in the OEM sector. The broad range includes lock kits, immobilizers, electronic and mechanical speed and mileage sensors. They also offer complete switches, dashboards and lighting systems for motorcycles and scooters. The product range also comprises safety systems and components for recreational vehicles such as caravans and motorhomes. 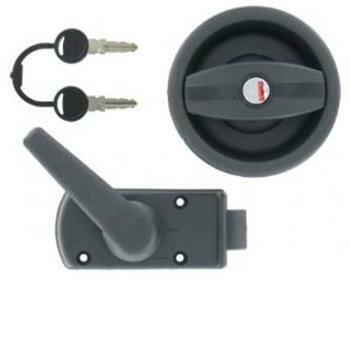 These include zadi motorhome door locks and zadi locks for caravans. Constantly focused on continuous improvement, Zadi possesses an Integrated Quality System which includes the ISO9001/Vision 2000 (Quality) Ohsas 18000 (Safety) and ISO 14000 (Environment) certifications. We sell a number of Zadi compartment Locks and door locks for use in caravans and motorhomes.